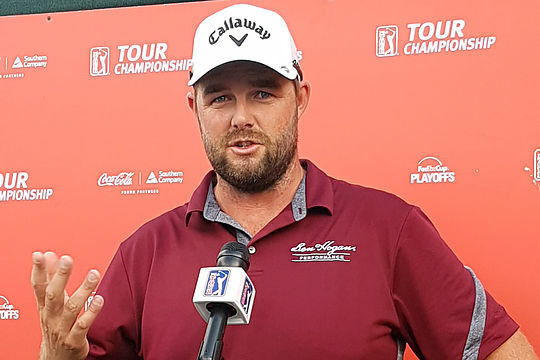 Marc Leishman was glad to find the comfort of the East Lake clubhouse in battling his way to a one-over par 71 on day one of the season-ending Tour Championship. It left the Victorian sharing 21st place and seven shots behind American Kyle Stanley, who signed for a sizzling six-under 74 in the hot and humid conditions just east of the Atlanta CBD. Leishman was running virtually on the smell of an oily rag after the superb efforts in his last two events starting with a gallant third place in the Dell Technologies and then leading from start-to-finish to capture the BMW Championship. Leishman was both tired mentally and physically following an opening East Lake effort that included two birdies but also a bogey and an unlucky 13th hole double-bogey where his drive was left and it took the Victorian five shots to get down from 144-yards out. “It was all pretty ordinary out there and I didn’t drive the ball all that well and I couldn’t get the speed of the greens so one-over was not all that bad considering,” he said. “So, if this is my poor round for the week then I will be happy. Leishman played the first round in the company of World No. 1 Dustin Johnson and the two had plenty to talk about on their way around course, with both having had children born recently and both girls. “It was good playing with DJ today being the best player in the world and he played well for his two-under score,” said Leishman. In ending his round, Leishman gladly signed a golf ball which he gave to one of the walking scorers who indicated to Leishman her daughter had broken her arm earlier today and a signed ball would certainly lift her spirits. Jason Day, the only other Australian in field, posted a 1-under 69 to be sharing 11th place and like Leishman he is also now looking for a low second day score. “That wasn’t a bad start and it felt good while the only thing that I was a little disappointed about was my chip shots out of the rough,” said Day.